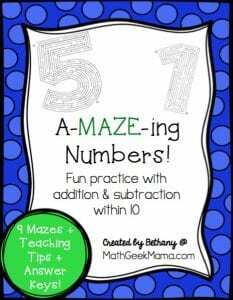 As my daughter gets close to finishing her first grade math curriculum, I’m trying to find fun and creative ways to review and practice math skills. Whether it’s taking it outside with sidewalk chalk, or playing a game, I like to make it challenging, yet fun. 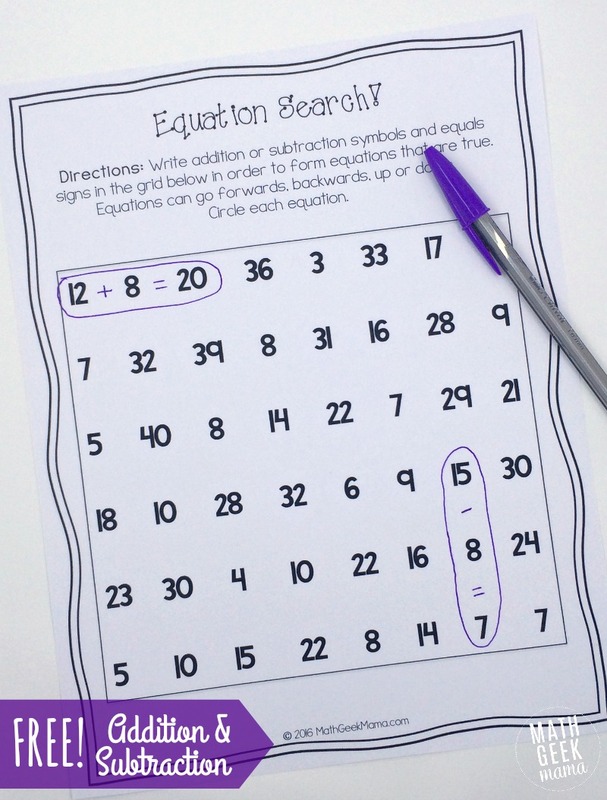 So last week I created an “addition and subtraction equation search” to help her review and practice addition and subtraction with one and two digit numbers. 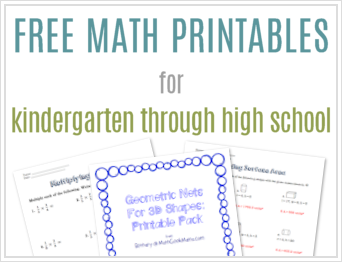 This is great for kids in kindergarten, first grade or second grade! As excited as I am to share this, this idea is not unique to me. She had a similar challenge in her Singapore math workbook earlier this year. 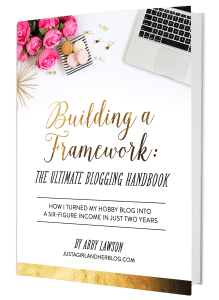 But I loved the idea and the way that it forced her to think and find her own problems, rather than simple drill, drill, drill. Plus, by creating my own, I can tailor it to her level and difficulty. Because she’s recently been working on adding and subtracting one digit numbers from two digit numbers within 40, these equation searches focus on these skills. This is similar to a word search, but for math. The difference is that there isn’t a specific list of equations to find, so you’re on your own. What’s great about it, though, is that there are so many different possibilities! 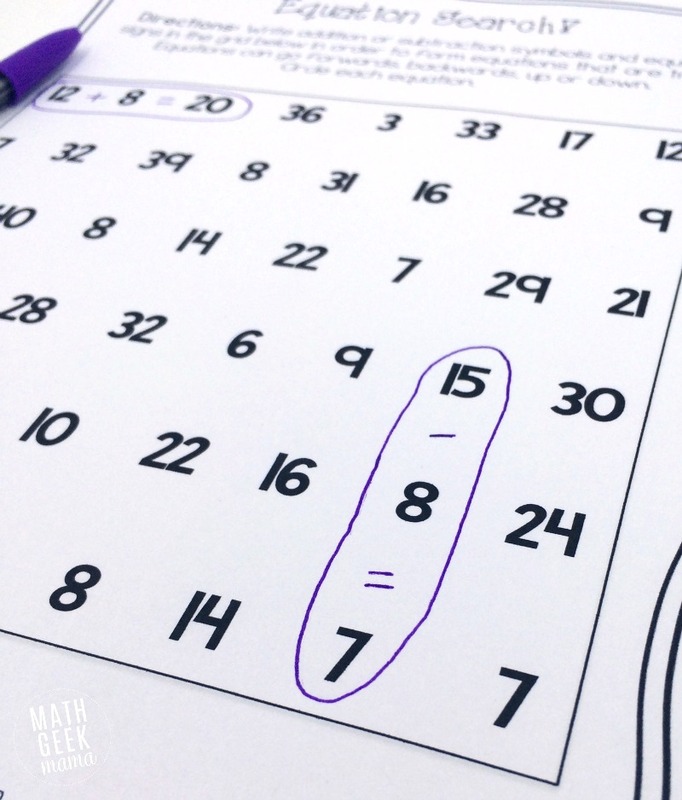 To find an equation, simply write in addition and subtraction symbols, along with an equal sign to form equations that are true. I circled a couple of examples for her to give her an idea of how to use it, but then she was on her own. I was proud of how much time and effort she put into this, because it can be quite challenging. 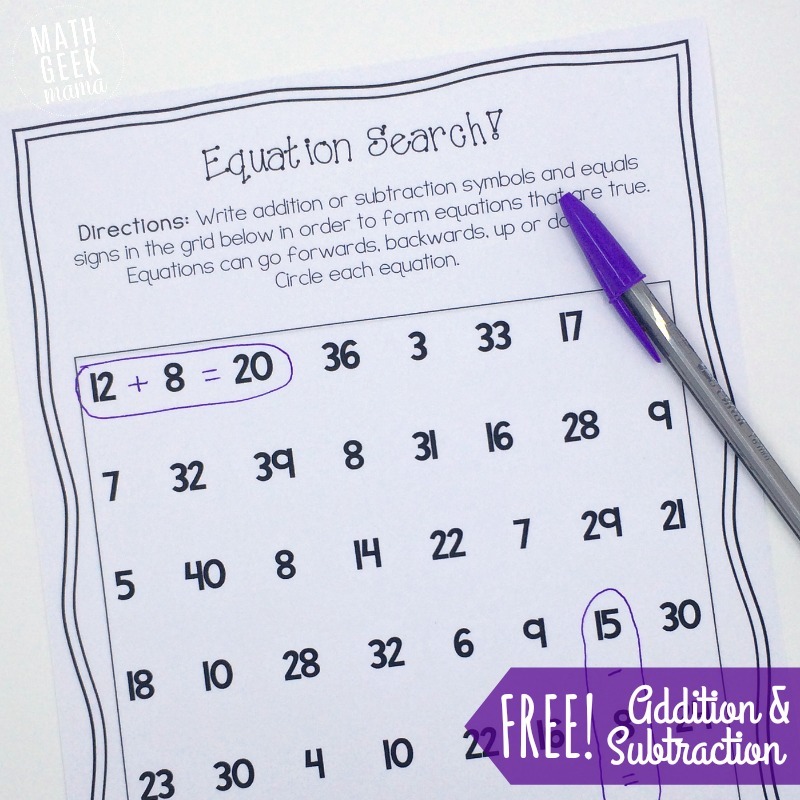 Would you like a copy of the addition and subtraction equation search? Included in the download are three different equation searches. Please note, however: this does not include answer keys. The reason is that there are so many different possibilities, it would be a huge, jumbled mess to try and show all the different correct equations. For one, some of the possible answers overlap, but also because every possibility could be written as an addition or subtraction equation. For example, at the very top are the numbers 12 8 and 20. 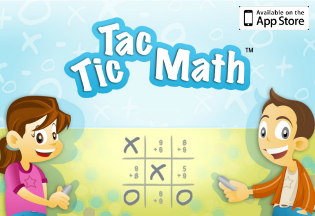 With those numbers, you could write 12 + 8 = 20, or you could go backwards and write 20 – 8 = 12. So I suggest you simply set a timer (maybe 10 or 15 minutes?) and then just check the equations students create for accuracy. This could also be a fun quiet review for students who finish their work early, or for a day when you leave students with a substitute. 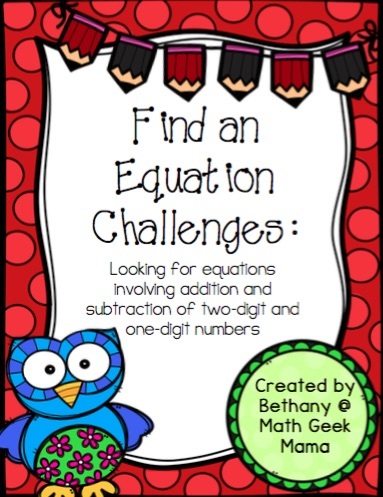 However you use it, I hope it provides a fun and unique challenge for students, and also helps reinforce important math skills!